The Bulgarian Air Force took its first MiG-23BN Flogger-Hs and MiG-23UB Flogger-Cs in late 1976. A small group of pilot and maintenance personal underwent type conversion at the 5th Combat Training Center’s 715th Air Training Regiment at Lugovoy in the Soviet union in the summer of that year. 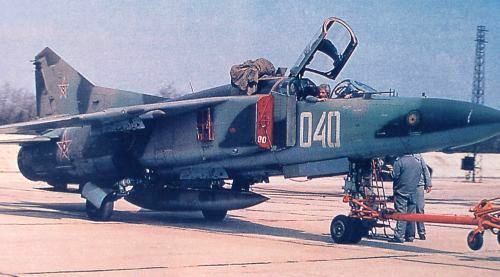 The MiG-23BN Flogger-Hs were acquired as part of the Bulgarian efforts to enhance the strike/interdiction capability of the air arm. 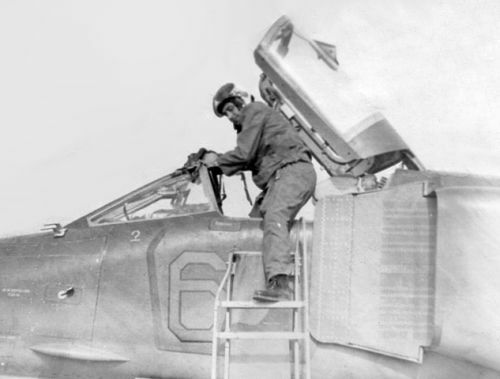 The two squadron 25th Fighter Bomber Air Regiment based at Cheshnegirovo airfield traded its 40-plus MiG-17 Fresco-A and MiG-15UTI Midget for 36 MiG-23BN Flogger-Hs and seven MiG-23UB Flogger-Cs. 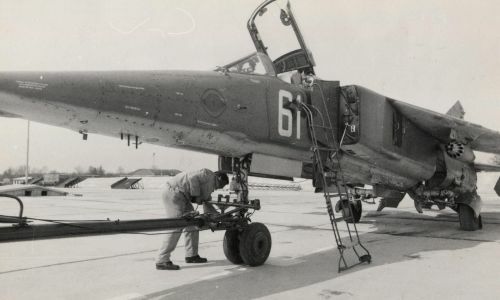 <- Bulgarian Air Force’s pilots getting in a Soviet MiG-23BN Flogger-H fighter-bomber aircraft in Logovoy in 1976. The first MiG-23UB (b/n: 020) was delivered to Bulgaria on November 1, 1976; it was followed on November 30 by MiG-23BN Flogger-Hs and on December 27 by two more MiG-23UB Flogger-Cs. 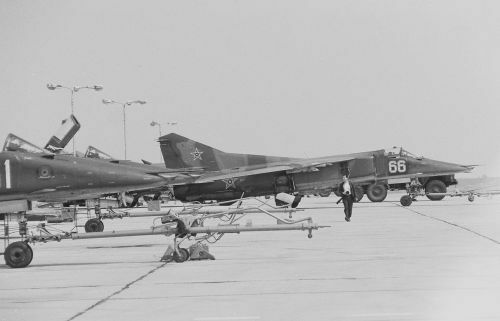 The first three batch Bulgarian MiG-23BN Flogger-H arrived with grey color between 1976 and 1978. 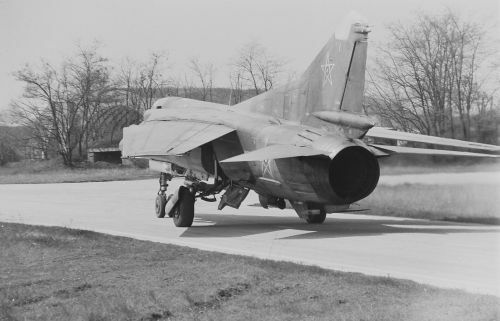 Bulgarian MiG-23BN Flogger-H on the Shield-82, the first major Warsaw Pact exercise in Bulgaria in 1982. 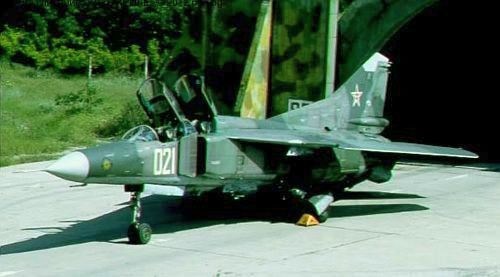 The MiG-23BN Flogger-H become the Bulgarian Air Force’s ground attack workhorse for nearly two decades and it retained its special importance until the mid-1990s. The ‘duck-nosed’ Flogger-H featured spectacular low-level performance and significant (for the 1970s) navigation/attack and self-protection suites. 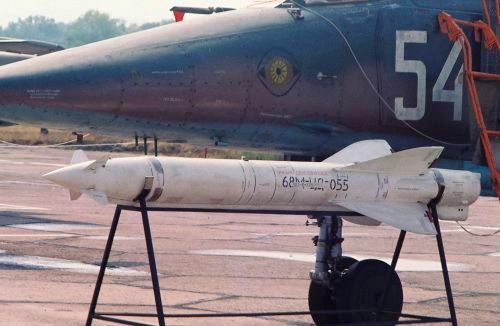 It was the Bulgarian aircraft to have the capability to used guided air-to-ground munitions – the first such weapon in Bulgarian Air Force service was the Kh-23 (AS-7 Kerry) radio command-guided missile. 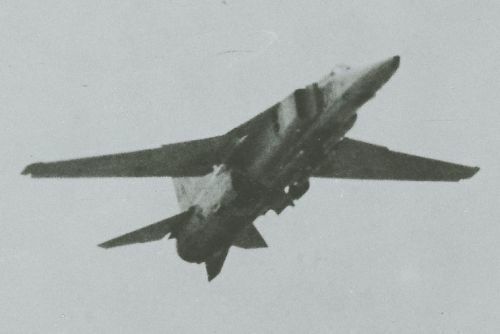 The MiG-23BN’s maximum bomb load was 6,600lb (3,000 kb), usually either shigh explosive or fragmentation bombs, unguided rockets and UPK-23-250 23 mm twin-gun pods. The Flogger-H possessed a significant self-protection suite The internal SPS-141 Siren jammer, with a transmitter antenna in the nose, was optimized for use against the fire control radar of the Hawk an Nice Hercules surface-to-air missiles (SAM). 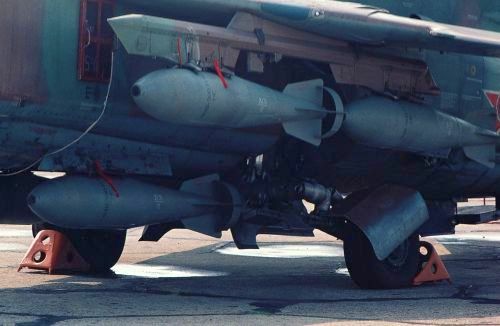 All the Bulgarian single-seat MiG-23s (include the fighter versions) were to carry a single nuclear bomb. A mall number of 25th regiment pilots underwent a special training course in the Soviet Union to deliver the nuclear bomb by toss bombing from low level. 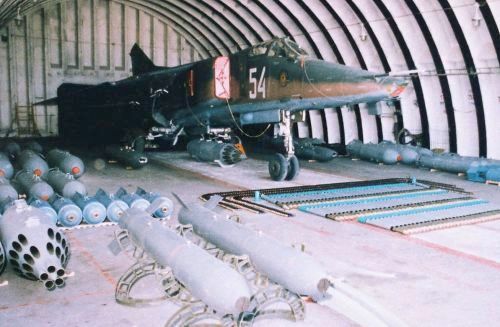 The nuclear delivery system of all Bulgarian MiG-23s was removed in 1991. 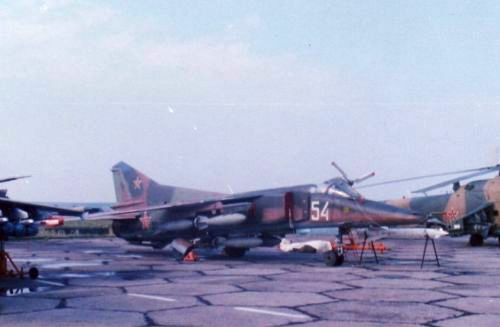 The last four Bulgarian MiG-23BN Fighter-bomber soldiered on at Cheshnegirovo airport until late 2000. 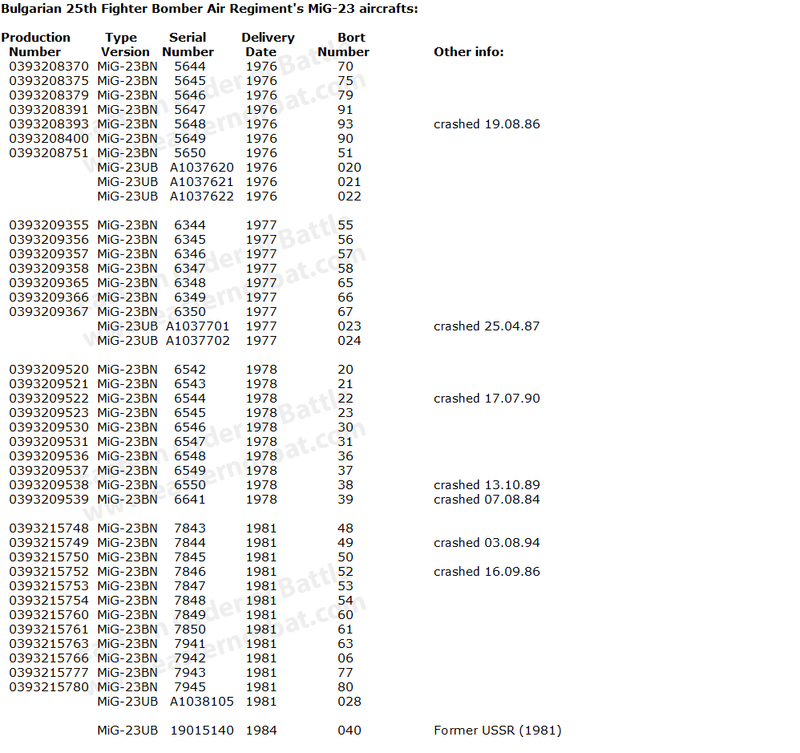 In their 25-year career six MiG-23BN Flogger-Hs were lost killing one pilot. 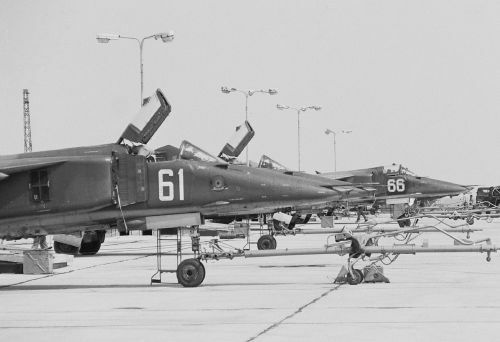 The Bulgarian 25th Fighter Bomber Air Regiment received six MiG-23UB Flogger-C trainer aircraft (b/n:020-024 and 028) between 1976 and 1981. 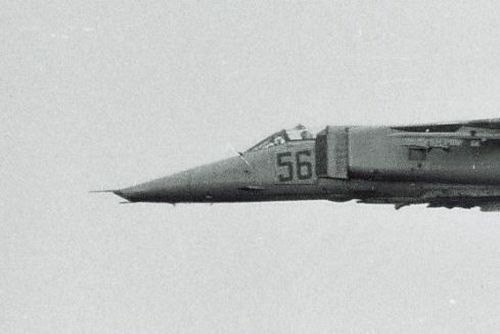 In 1984 25th regiment got a former Soviet second-hand MiG-23UB Flogger-C trainer aircraft (b/n: 40). 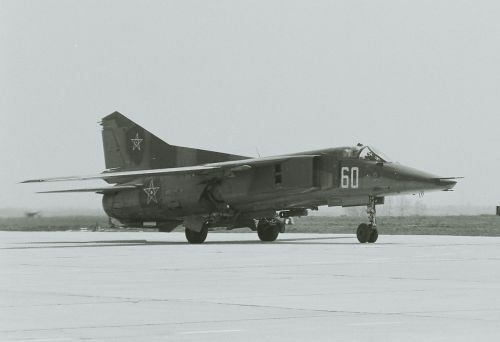 A MiG-23UB crashed on approach to Cheshnegirovo in the second half of the eighties.